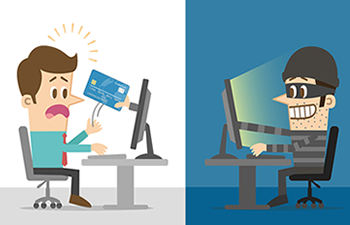 Don't be a victim of identity theft — Peace of Mind Financial Planning Inc. There are many ways to have your identity stolen. Even if financial institutions don’t hold you responsible for losses from unauthorized use of your credit cards and bank accounts, cleaning up the mess can be very time consuming and take months – or longer – to fix. Despite everything you do, you might still have your identity breached, but there are some basic things you can do to make it less likely and to find the problem quickly. Be careful what web sites you go to in general, especially those where you shop online. Even if you’re not shopping, some web sites are set up to plant a virus on your computer that will be able to spy on it. This would allow a hacker to get your logins and passwords. So only use trusted sites to order items or check your account balances and activity. Also, use safe internet connections. A hotel or coffee shop isn’t the best place to check your bank account balances online. Most of these places tell you others may be able to see your computer when you log in so, consider having software installed that makes your computer safer on public internet connections. Regularly monitoring activity on accounts will help you know quickly if someone else is using your account. Even small charges are worth questioning. If someone is using your credit card, they might start small and escalate if there’s no indication that you review the account. If you do see unusual activity, check the dispute rules for the account. You usually need to be prompt in reporting a problem to avoid being held liable for the activity. You’ll probably be asked to cooperate in any legal action with the financial institution to take legal action against the unauthorized activity. Review each of your credit reports annually. There are three reporting agencies: Experian, Equifax, and TransUnion. Each of them will give you a free credit report once a year. So if you check one of the reports of one of the agencies every four months, you can do it for free each time. If there is an account on a report that you didn’t open, immediately contact all three credit agencies to report the error. Also contact the issuer of the account. Follow up with the credit agencies and the issuer until all have verified that they do not have that account attributed to you. If a company you use has a data breach and notifies you of it, avail yourself of any services they offer to help you see if you have been impacted. If they don’t offer you any support, ask them for support. Also, step up your own monitoring activities. If you decide to use a paid service that protects or helps you resolve identity theft, you still need to monitor your accounts and credit reports. It’s ultimately your responsibility.